If the battery is the heart of a scooter, the controller will be considered the brain. All electrical functions go through this little (mostly silver) box. It is commonly located inside the deck of the scooter, just beside the battery. The controller also limits the amount of power that can be "pumped" into the motor and cuts off the power supply if it detects a preset low battery voltage. This is to protect the battery from getting damaged, similar to what a BMS (Battery Management System) does. Below you will find an image of a typical controller, it's functions and specifications. Some functions are common, others not so much. 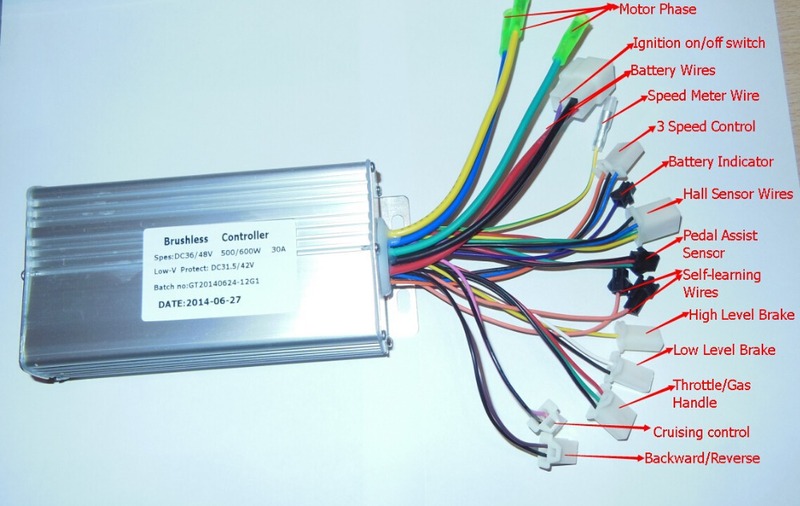 Hall Sensor: Controllers with hall sensor wires commonly do not work with motors that do not have hall sensors but it works vice versa. Pedal Assist (PAS): For electric bicycles only. Connect your pedal assist sensor here. Motor Brake: To automatically cut power to the motor when braking. Connect brake lever switches here. High/Low Brake Level: To enable motor braking (direct drive motors only). 'Low' provides a low amount of braking force and 'High' provides a high amount of braking force. Either one could be used depending on the amount of braking force you would like to have.